Body fat measurements give you a better understanding of the health of your body compared to the scale. Instead of only knowing your gross weight -- which includes bones, fluid, organs and connective tissue -- your body composition measurement tells you how much of that weight is made up of fat. Excess fat can be dangerous to your health, raising your risk of heart disease, stroke, type 2 diabetes and some cancers. When your body fat measures more than 30 percent, regardless of your gender, you definitely carry too much body fat and are considered obese. All people carry some body fat to support their basic bodily functions. Fat in the marrow of your bones, internal organs and in the central nervous system is this essential fat. In men, essential fat measures between 2 and 5 percent. In women, it measures between 10 and 13 percent. Women carry more essential fat because of childbearing. All other fat is storage fat, harbored just beneath the skin or around the internal organs. The body uses storage fat for energy and to help regulate your body temperature. Of course, eat more calories than you burn and your body stores the extra as fat -- whether or not you need the energy or thermal regulation. Body fat measurements are usually presented as a range, because not every body is the same -- and as you age, your ratio of fat to lean mass naturally changes because of age-induced muscle and bone loss. A healthy body fat range is generally considered to be 14 to 31 percent for women and 6 to 24 percent for men. Fit women and athletes have body fat percentages on the lower side, usually 14 to 24 percent for women; a fit or athletic man's body fat levels are from 6 to 17 percent. A body fat level of 30 percent is excessive for either gender. Even if the scale puts you in a weight category that seems OK for your height, having this much body fat makes you vulnerable to the same health complications that obesity does. A weight in the normal range but with too much body fat, especially in the abdomen, is known as "normal weight obesity." In men, even 25 percent body fat should be considered a serious health risk. Your doctor's office may use a measure of body mass index, which is calculated according to the relationship between your height and weight. If you have a high BMI, it's likely that you have a high percentage of body fat, unless you're a body builder or a serious athlete. A healthy BMI doesn't mean you don't have any weight-related health risks, however. If you are sedentary or are an older adult, you may be at high risk for normal weight obesity, and the higher disease risks that go along with it. To lose body fat, create a calorie deficit by moderating your portions, choosing healthier foods and moving more. Exercise is important in body fat loss, as losing weight by diet alone can cause you to lose muscle mass along with some fat. Engaging in cardiovascular activity, such as brisk walking or swimming, helps you burn calories, but doing resistance training with weights, resistance tubing or your own body weight, helps prevent this loss of muscle. By creating an approximate 500- to 1,000-calorie-per-day deficit via diet and exercise, you can expect to lose 1 to 2 pounds per week. Losing up to 1 percent of body fat per month is probably safe. Always check with your doctor before beginning a weight loss and exercise plan. Is it Possible to Have a High BMI & Not Be Obese? 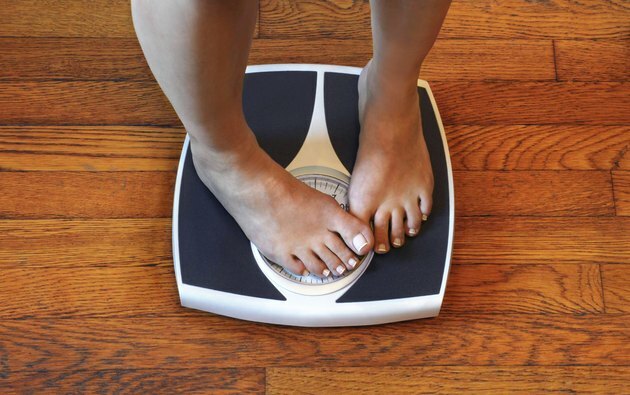 What Is a Good BMI For Women? What Is a Realistic BMI for Someone Athletic?